As you know, Punch with Judy was exhibiting at the Craft & Quilt Fair in Brisbane last week - thank you to all who came and visited our stand, chatted, purchased more "must haves" and attended our Nifty Notions demonstrations. I hope you enjoyed the show, another successful event for show organizers. For those who were not able to attend, I will give you a few blogs taking you there! 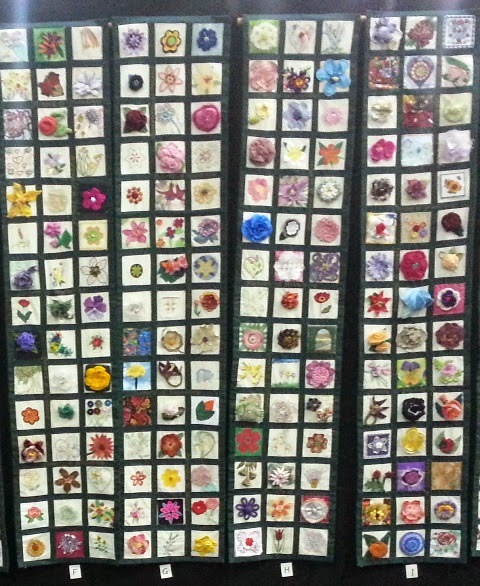 After close of show one day I ventured through the amazing Quilt Display and was VERY taken by the FLOWERS OF FRIENDSHIP displayed taking up a huge length of wall that it was so hard to capture in one photo. 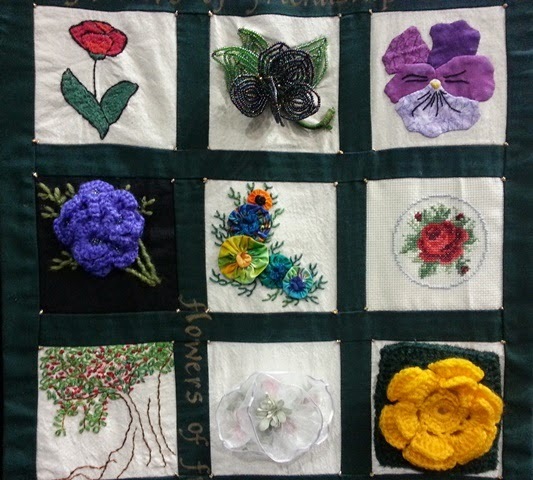 Flowers of Friendship is one of the many collaborative projects completed during Tricia Smout's year as Artist-in-Residence at Brisbane Botanic Gardens at Mt Coot-tha in 2012. Officially stated as "a unique, colourful, eye-catching handmade community textile artwork." I found it unbelievable as to the variety of techniques used in all the flowers and found myself absorbed in inspecting them noting the techniques I knew and many I'd never tried. Spell-bound with admiration with the 495 contributions from 355 individuals aged from 2 (would you believe?) to 91 (again, would you believe?) who mostly live in or around Brisbane. A fascinating variety of mediums and techniques have been used, from traditional to modern. Here are some closeups, taken randomly, for you to appreciate the detail. 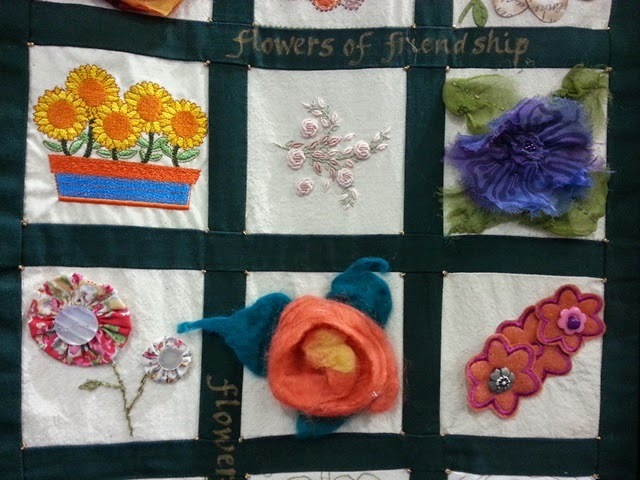 Flowers of Friendship is indeed a testament to the collaborative and creative spirit of Queenslanders. 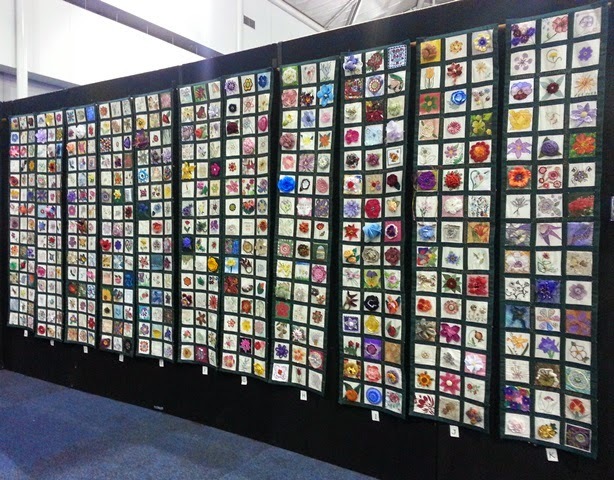 We are endeavouring to have it on tour for all the Craft & Quilt Fairs in 2015 so as many visitors to the shows can appreciate such community spirit. Tricia said that this community artwork needs a permanent home and is willing to discuss with anyone who may have hanging space on a prominent wall where it may be viewed regularly by the contributors and visiting members of the public. It certainly deserves a place where it may be seen and appreciated by as many people as possible. Have you got any suggestions or are part of an organization who may? 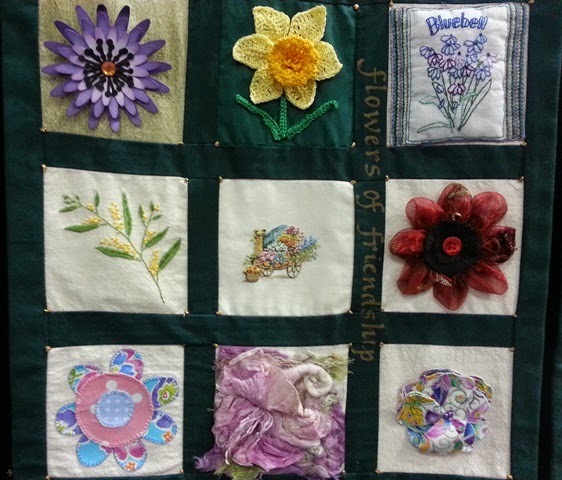 How beautiful the 'flowers of friendship' are, only wish we had room here for them,or an organization that could care for them.thank you Effie. Aren't they just Effie? They would prefer somewhere in the vicinity of Brisbane or closeby. I hope this inspires others to do similar. Judy & John Hall live on 100 acres in a small country town, The Rock, (near Wagga Wagga in the Riverina) N.S.W. Australia – inland, about halfway between Melbourne and Sydney. Here they run their Mail Order business as well as an Emu Farm and breed sheep. Judy loves sewing in general, anything to do with a sewing machine be it quilting, embroidery, home décor, crafts or clothing. She holds Retreats at The Rock as well as teaching and lecturing on the Show Circuit in every State of Australia and writes editorials for many National Magazines.